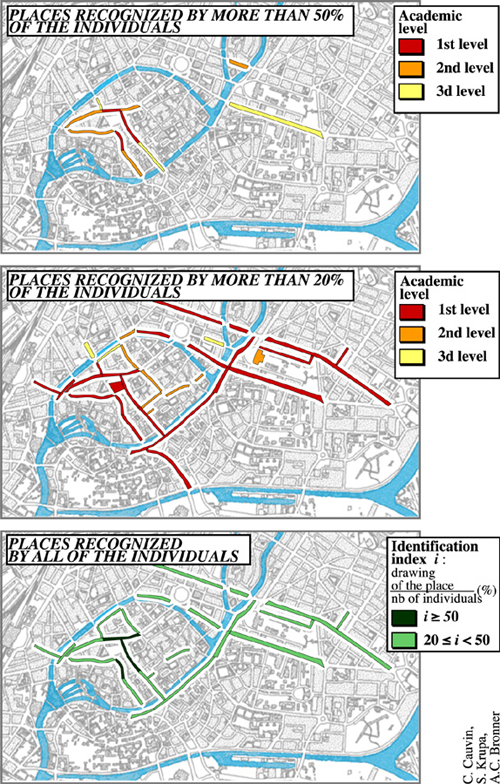 In order to clearly understand the cognitive representations of the urban space, this paper presents an approach in three steps: identification, which highlights the importance of a place; its location more or less exact which indicates the level of the individuals’spatial knowledge, and the description which specifies the significant attributes of these places for the interviewed individuals. In order to obtain comparable maps, a precise protocol is proposed for each step. Afin de clarifier les représentations cognitives de l'espace urbain, cet article propose une approche en trois étapes : l'identification, qui met en évidence l'importance d'un lieu ; la précision de sa localisation, qui mesure le degré de connaissance spatiale des individus ; la description, qui indique quels sont les attributs significatifs de ces lieux pour les individus interrogés. En vue d'obtenir des cartes comparables, un protocole précis est proposé pour chaque étape. Acknowledgements: I would like to thank all the students who have undertaken the surveys, especially Sophie Krupa and Kostas Daniilidis who offered their data to the laboratory so that they could be used for further research. Also, I would like to thank Helene Haniotou who accepted to translate this text, Anne-Christine Bronner who has produced the graphics and the various illustrations, and Rosine Schlumberger who, again, has proven extremely helpful. 1Spatial cognition, geography of behavior, life space have been the subjects of an abundant literature, very well described by authors like A. Sanguin (1981) R. Spencer and M. Blades (1986). These fields have been developed in successive waves reaching a first peak during the 70s, then a second one in the early 90s. This unequal production in geography has particularly concerned France, where, during a first period, various texts have been published on the perception of urban travel by A.S. Bailly (1977), and on life space by A. Fremont (1974, 1976). In a relatively short time, these publications have been completed by research on social (Pau) or mental (Grenoble) representations, being the origin of several conferences, as these of Neuchâtel (1983) and Lescheraines (1985). Currently, a new field in geography is emerging using representations, which are much more cultural, such as the research by B. Collignon (1996) on the Inuit populations. 2The research undertaken in Strasbourg — as in Metz by C. Rolland-May (1981) — has followed slightly different orientations. It has initially been inspired by A. Moles (1972), with a first study under the direction of S. Rimbert, then developed since 1981 by C. Cauvin influenced by the ideas first introduced by R. Golledge in the USA. However, most of the French geographers have remained outside the international currents, and this kind of research is yet far from been generalized. In this context, the approach that we have privileged concerns intra-urban spaces. 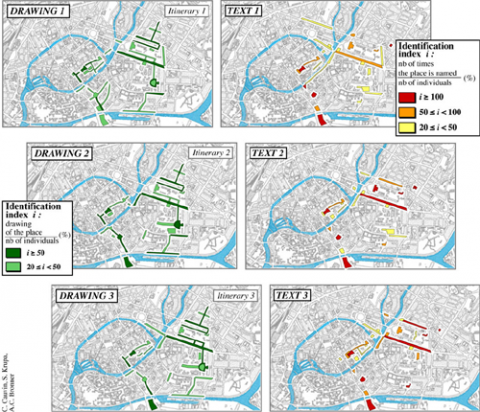 3If knowing the characteristics of an intra-urban space seems natural to a geographer, re-cognizing its representations is unequally acknowledged as an interesting research subject. When a person arrives in an unknown city, when he is moving around in a new neighborhood, he needs to find his way about, to recall his cognitive representations which have been and still are the subject of a great number of studies (MacNamara, 1986, 1992). Any person living in a city, faces at a given time a very complex world where it is possible to put some order, only if the notion of subjectivity is accepted (Bailly et al., 1995). For the comprehension of urban space, for its modeling, its modification, we need to know these representations of which we admit the existence, because they imply and induce our behavior. 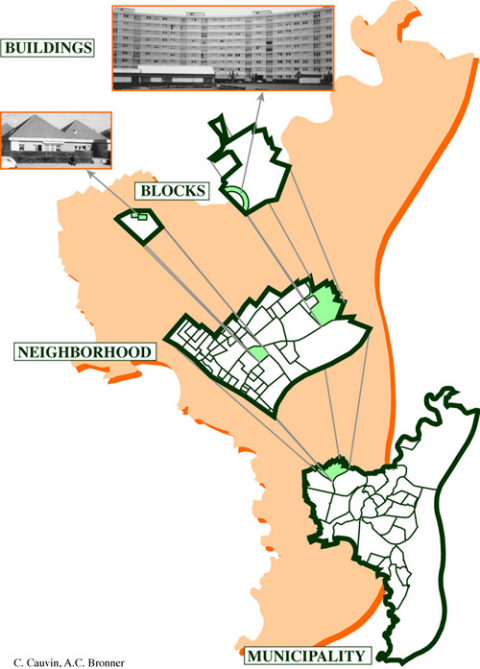 4This urban space to apprehend, is constituted by places and links, i.e. urban components, which are to be described from an "objective" point of view — we will discuss this term later— as well as from a "subjective" point of view. After a thorough study of the available literature, we realize that the conditions to obtain comparable results are not always fulfilled. The comments on the conclusions of R. Briggs' (1972, 1973) and D.C.D. Pocock's (1978) works are some significant examples. 5Thus, our aim here is to propose several experimental protocols leading to comparable results, i.e. to identify the elements which are indispensable to an urban representation study; they will be underpinned by some results, given as examples. These studies, based on a considerable number of surveys, will also allow a further development of new finer hypotheses requiring experimentations stricto sensu. 6For this, we will specify, in a first time, how to apprehend the urban space, then we will describe, in three successive parts, the three phases of the cognitive analysis of the urban space. 7To apprehend, the most correctly possible, the urban space, it is necessary to identify some of its components, to analyze them in a comparable manner, to consider them in their totality. That means — as suggested by W. Pauli in his letters to C.G. Jung (1992-2000) — to combine the physical and psychic aspects, because any town or city, through its various components, has this double aspect. 8Physical or material, and psychological or cognitive aspects form the two faces of a city, which either complete or oppose each other. 9The city is a space formed by places and links, which are to be known, on the one hand, exactly as they are given, constructed, on the other hand, such as they appear to the users, i.e. "filtered". In the first case, it is the organized space that is concerned. The space that can be used, that can be "objectively" described, in a sense that this space is measurable by anybody, using instruments, in an identical manner; it serves as a reference. 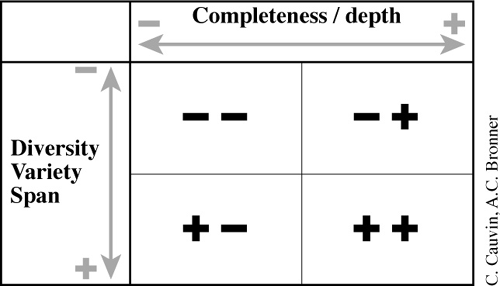 In the second case, filtered spaces are the users' spaces, modified according to a reference, but spaces that can only be conceived in the plural; they are as many as the individuals but differ from each other in various degrees and are in perpetual evolution, as is shown by F. Varela (1989). Measuring them is difficult and induces directly the problem of aggregating individual data, since what we actually seek in geography is social and/or spatial regularities, and not personal explanations. 10But, is it necessary to retain the average information, or should we look for the common parts of all the responses? We remind this question here, because it has been the subject of many debates of which we have already abundantly spoken in various publications (Cauvin, 1984a, 1998). Whatever the answer retained, the measures can be compared to the reference; it becomes then possible to have an evaluation of the accuracy or of the distortions. Therefore what interests us is the components of the filtered spaces, with the errors related, but in a specific spatial scale. 11Most of the studies undertaken by psychologists are focused on very large scales: the laboratory, the hall or, to the maximum, the campus; spaces where it is possible, for the experimentation, to prepare the environment, to adapt a certain number of elements, to introduce modifications. The geographer is concerned by the scale of the campus, to the minimum. Actually, what interests him is the neighborhood or, more often, the city as a whole (Fig.1). 12But, envisaging to "manipulate" space, proposing visible spatial changes, constitutes a rather difficult operation. Can a street be barred, or some of the signals removed, so that we could verify the consequences on the people’s representations and behaviors? The scale, at which we have been led to work, induces many constraints to be taken into account in the study of the urban components. In order to understand these urban components, to explain them, we will make use of some of the surveys realized in Strasbourg. 13All the examples, procedures, results that we are going to present here are based on the surveys undertaken by the author and her students at the Image et Ville laboratory in Strasbourg. They can be divided in 3 subsets, according to their objective and the retained techniques. It is important to know the basic rules in order to avoid any interpretation errors. 15A second group constituted by students had both a thematic and a methodological objective. The protocol and the methodological approach have been developed on a test-group and then, they have been applied on a sample of one hundred persons; it contained estimations of distances, a sketch map and a questionnaire; its purpose was the comprehension of the links between places. 16These two families of approach aimed essentially to find the general features in spatial cognition, to verify therefore the basic hypotheses, and, especially, to prepare the next step: a more advanced study. 17The last group of studies is under way. It concerns tests on movement and landmarks or on handicapped persons. The number of the interviewed individuals is low (between 12 and 25), but the experimentation is relatively long and often repeated in time. The interviewer accompanies the interviewee who undertakes a journey, and who does not recall therefore but memories of events that just happened or that are under way to happen. 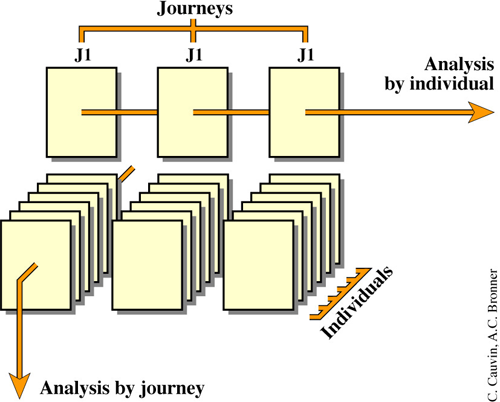 For a specific transportation mode, the interviewee undertakes a journey that he describes directly, during the action, and of which he gives some characteristics at his arrival, with the assistance of several convergent techniques. This operation is repeated several times. Thus, we can obtain, at this stage, a great amount of information on various characteristics of spatial knowledge. 18In order to understand these data, we are going to use the definition of geographical space, given by H. Beguin and J. Thisse (1979). According to these two authors, the geographical space is constituted by a set of places, a vector of attributes, and of one or several distances defined on the set of places. This induces three characteristics of the space to know, which remind the geographic facts introduced by B.J.L Berry (1964): identification, location and description. These three characteristics are going to be apprehended in a very detailed manner, in the following chapters. 19A place is identified if it is re-cognized, because it has a particular meaning for a individuals or a group of individuals; it is named, it has an identity. How this identification can be useful for the knowledge of an urban place? 20Identification means that, for a place to be recognized, it is necessary that this place contains something with a special meaning to us, according to R. Golledge (1976, 1992). As M. Heidegger (1969) wrote: "Everywhere, wherever and however we are related to beings of every kind, identity makes its claim upon us". The identification translates a differentiation; one place, among many, is distinguished from any other place; it is a separable entity, an "individualized" one for K. Lynch (1976). Thus, the places of a city, having a meaning for the individuals concerned, have been retained, as in the example given by J. Von Uexkhul (1956) where the stone has acquired a meaning for the dog. 21An identified place means that "the place X exists", writes S.M. Freundschuh (1991) while describing one of the spatial-knowledge models. The first step of this knowledge leads therefore to the statement of a re-cognition of places or links, which corresponds to the knowledge of landmarks or to a declarative procedure, i.e. to the answer of the question "what?" (Smith and al., 1982). 22The identification of a place can be made by one of the five senses, by the memory; it results to any kind of drawing on a paper, at the best to a name. Furthermore, the recognized points do not all have the same meaning. One can recognize the chosen points, considered by the interviewee as significant; on the contrary, points can be selected spontaneously and constitute landmarks (Tversky, 1992). The identification constitutes therefore a discontinuous inventory of information contained in the long-term memory (Golledge, 1992), and the corresponding survey techniques are going to provide lists. 23Whatever the technique, at a given moment, we are confronted to a succession of information concerning places. These techniques are numerous: enumeration list, sketch map, free-expression text, photograph, etc. We are concerned here, essentially by the drawing and the text. 24The sketch map is a classic technique, very controversial, but it has the advantage that it can be used by almost anybody (Canter, 1977; Blades, 1990). However, we have observed that old people refuse to draw, considering this as degrading, not wishing to provide such an effort. Likewise, for some African populations, drawing has no spatial meaning: a place is above all a social object, the expression of which is verbal. 26in the first case, a person has to draw by memory a given space, supposed to be known. He indicates freely on a sheet of paper (A3) what he recalls of the chosen space. 27in the second case, a person has to draw on a sheet of paper (A3) the itinerary he followed by signaling everything that seems important. 28Whatever the procedure used, we have only retained here the identification of recognized places. 29The textual experience has only been undertaken as a methodological test (Krupa, 1999): the interviewee covers a given space and describes, using a microphone, everything he sees, he knows, that seems to be important. The purpose of the study is to identify the route difficulties for cyclists, as well as to identify landmarks allowing them to find their way, or to identify the reasons for the itinerary chosen. The option for a text inquiry supposes that we are, at least partly, in agreement with the Z. Pyslyshin's (1981) theory. The processing has been made by textual analysis, only retaining, at this stage, the frequencies of named places. 30The technique of photography has been adopted only in the case of African populations (Riehl, 1998) and has allowed the identification of places well known by the subjects. Nevertheless, the way in which the photographs have been taken can considerably modify the results. 31However, at the end of the interviews, we had an inventory of places, streets, recognized places, with, sometimes, the variations related to the studied groups. 32The more or less great abundance of names expresses the degree of knowledge of the city by the interviewed individuals, but without their transformation in indices and their mapping, this information remains insufficient and not easily comparable. Three indices have been proposed, described in detail (Cauvin, 1998). Two of them are particularly interesting, and possible to generalize (Fig. 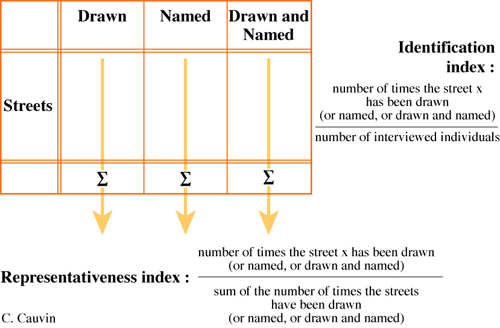 2): the identification index which corresponds to the ratio of the number of recognized places to the number of interviewed individuals; and the representativeness index corresponding to the ratio of this same number to the total number of identified places (external rates). 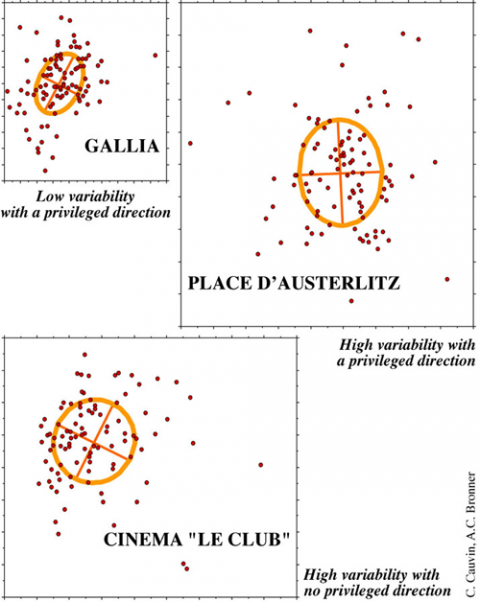 The representativeness index indicates the weight of the recognition of a place to the totality of the studied places. 33These two indices allow us to stress the role of a number of factors in spatial knowledge. Thus, two studies with students between 18 and 26 years old have underlined the role of the length of residence, in agreement — in particular — with the conclusions of R. Golledge (1990, 1995) on the familiar-space knowledge. One of the surveys (Cauvin, 1998) puts the accent on the progressive coalescence of the known space, when the length of residence, in a city, has increased from one year to more than 3 years. Another study, of which the related maps are presented here, leads to the same conclusion, by simply differentiating the academic level (Fig. 3). 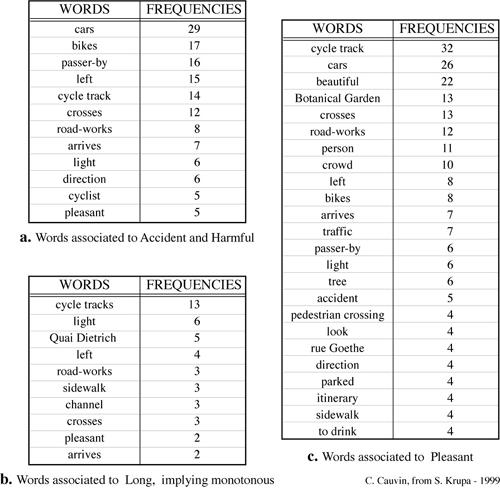 34Other factors have equally been highlighted, such as the role of the everyday transportation mode or of the frequency of the games in the street, for children between 8 and 14 years old, or differences related to the urban pattern: legible spaces facilitate memorization. Thus, sketch maps of the small town of Turckheim in Alsatia (Sassi, 1989) demonstrate that the knowledge of the territory is much superior to what we usually have from children between 10 and 11 years old. 35Our conclusion, in agreement with the results by J. Pailhous (1970) and R. Golledge, (1995) is the following: age or frequency of a specific itinerary extend the known space and structure it; after the constitution of a basic network, secondary lines appear and induce the emergence of a continuity. The survey undertaken with 3 journeys proves it (Krupa, 1999). 36However, two facts of unequal interest are to be noted (Fig. 4). First of all, and this is very important, it seems that the information provided by texts is of a more punctual nature, and this of sketch maps more linear or areal. This is undoubtedly due to the technique, but deserves verification — the group is only a test-group — in order to avoid any erroneous conclusions. Then, with repeated journeys, a negative factor appears, after a certain time: the lassitude; the individual interviewed quits noting the important facts, forgets some, does not see their usefulness. 37At this stage, we can establish a first protocol allowing to obtain comparable results, in terms of identification, with interpretation of results concerning urban spaces (Fig. 5). 38At the end of the first step, we recognized the importance of some places; we know how to identify a place, but if we want to go there, to link these places, we don't know where they are; we are not able to figure out a path to get to them. Our knowledge of these places is incomplete. Identification is not sufficient; to move towards a place, we need to know its location. 39Initially, the location expresses the absolute address, i.e. the position of a place or of a set of places related to a reference, expressed in geographical coordinates. This corresponds to a Poincaré’s point of view concerning space, as indicated by P. Forer (1978). In this case, space is considered as a container, as an entity in itself. In the opposite case, objects are only positioned, one in relation to the others, in a given space. Therefore, the location approach varies, according to whether or not we take into account a reference. It is in this last case that can be used terms such as accuracy, error, distortion… What is the meaning of location in an urban study? 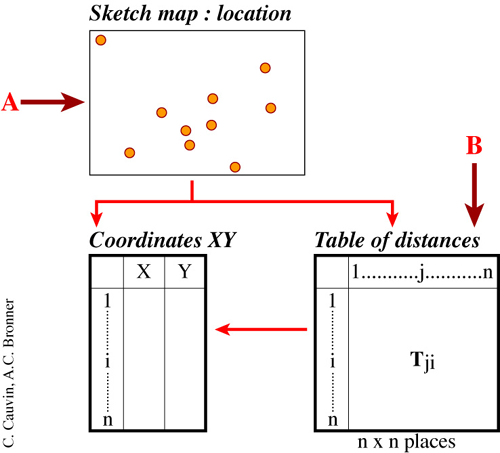 40A location corresponds to the knowledge of an address, whatever it may be: coordinates, text… The way a location is expressed can change, but the location itself does not change through time. Henceforth, "X is located" (Freundschuh, 1991); we can link it to other places. 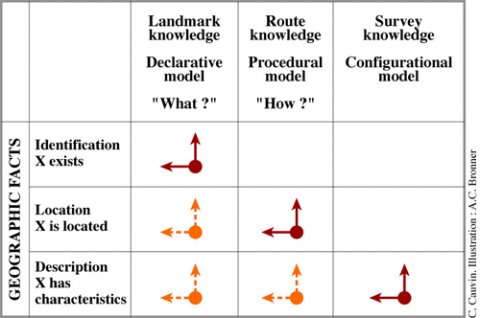 The knowledge of the location corresponds to what is called the "route knowledge" and therefore to a procedural model (question "how ? "), which can be modified, evolve towards a configurational model, when all the elements (nodes, paths, networks…) of each place are known. 41Any identified place can have a location, but often, it is the groups of locations that are more interesting because they express the positions of each place in relation to each other. Short distances, between locations, express the association of places considered to be close to each other, which can have different interpretations. In spatial terms, this means that the interviewee considers that these places are close, that the distances separating them are short. There can be social interpretations, functional, economic, affective ones. Sometimes, especially liked places are associated, and disliked places are distanced, as for example the Oberlin bookshop in Strasbourg (Cauvin, Reymond, 1984), not very well-known, visited, or attractive in 1981. How can we obtain and use locations? 42Among the various available techniques, two have been tested systematically: sketch maps and direct estimations of distance. 43In the case of sketch maps, we have marked, on the drawing, the coordinates of points easy to identify, and on the reference map, the homologous points, seeking for a maximal covered space. Then, we have compared the two sets of pairs of coordinates, by using the bidimensional regression (Tobler, 1977b, 1978; Cauvin, 1984b, 1998). The reference being the same in all cases, the resulting images have, thus, become comparable. 44Let us specify that other survey techniques have been retained (Fig. 6): M.D. Giraudo (1989) collects distances between points and works on distances, in agreement with the technique of distance estimations. 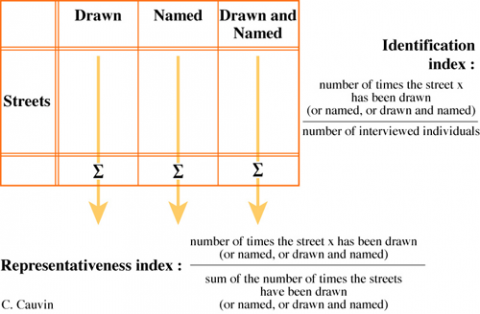 With this procedure, the interviewed individuals are asked to estimate the time-distances between a set of pairs of places, supposed to be known; we establish then a matrix of (n x (n-1)) distances (where n is the number of places) for each subject. 45This technique requires a lot of time and patience from the interviewed individuals, but it allows the externalization of spaces in mind and produces a concrete map/configuration on a sheet of paper or on a screen. First, through the multidimensional scaling, or trilateration (W. Tobler, 1977a) or even the elastic cartography (J-C Müller, 1982), we are seeking the relative positions of places (Cauvin, 1984c, 1998), using matrices of estimated distances. Second, we compare these relative positions to their homologous positions, according to the reference, using the bidimensional regression, thus constructing the distorted space associated to each set of estimations, which is the cognitive configuration of each subject. 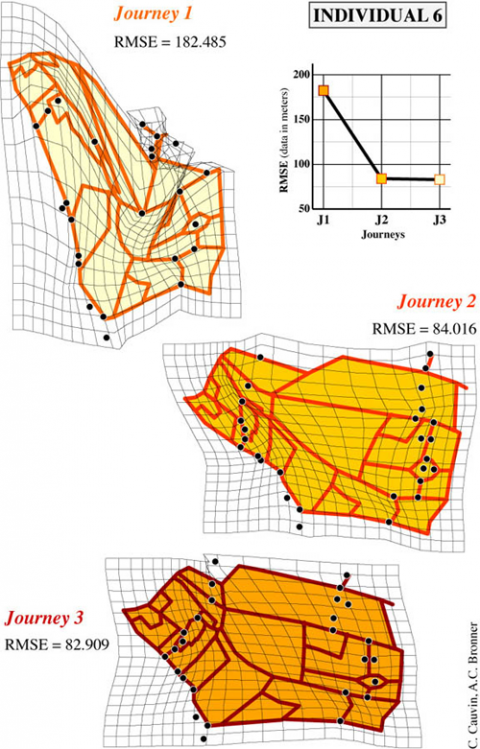 We obtain, this way, many maps and statistics (Fig. 7). 46Among the various obtained sketch maps (Fig. 8), the analysis of precise locations by the cyclists, during the three successive steps, shows that the average error clearly diminishes, between the first and the second journey (RMSE = 106.96 m and 89.96 m, for the average displacement after adjustment, 101.08 m and 84.42 m after interpolation), but it remains stable or slightly increases, during the third journey, which seems to be explained by the lassitude of the subjects. 47On the contrary, the distortion, i.e. the spatial contradictions, measured by the average index m2, diminish only at the third stage: 1.433 and 1.400. The maps of the displacement vectors and the anamorphoses express, of course, these tendencies. 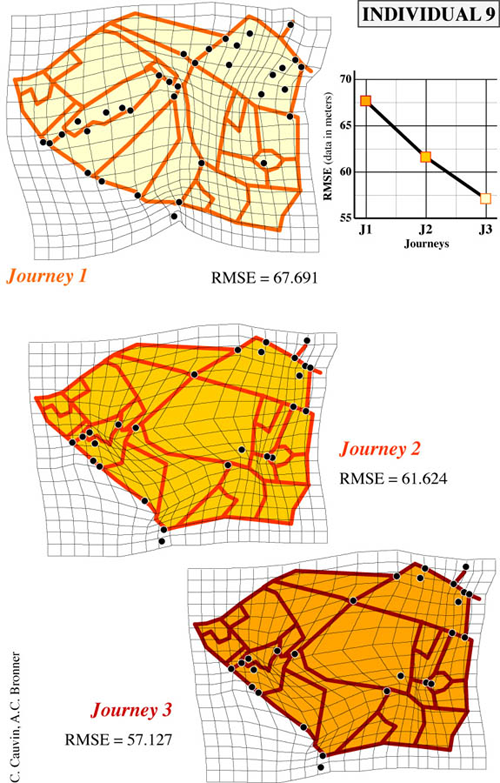 To very slightly distorted spaces — accurate enough, which do not change from one journey to the other, like those of interviewed individual 9 (RMSE=67.69m and 57.13 m) — are opposed spaces completely deformed for the first journey, possibly improving afterwards, like those of individual 6 (RMSE=182.49; 84.02 m; 82.91 m) or those of individual 2 (Fig. 9). Nevertheless, considered the low number of the interviewees, it has not been possible to identify groups, according to the errors and distortions, as it has been the case for the study on Strasbourg, where the usual transportation mode was a discriminating factor. 48Another process, proposed by M. Mattenet and J.M. Jolion (1992), is quite interesting especially for the study of a well-delimited space, the general shape of which is considered and analyzed as a fingerprint. Unfortunately, it has not been possible to present this process here, for which a special software is needed, but it is surely worth testing. 49Thus, when we have a reference, it is possible to analyze locations, in terms of errors, distortions, and to interpret these results thematically, highlighting the located places, with accuracy or not, such as the two Places in the South of Strasbourg. Moreover, explanations have to be found, which is possible when the sample is of a sufficient size, and if a discussion can eventually take place with the interviewed individuals, a posteriori. 50Another measure is equally interesting, with no relation to the reference this time: the internal coherence, which introduces the notion of variability, often called "fuzziness". Actually, the responses given by a group concerning a given place are not necessarily identical. The positions are spread around a mean center. The standard ellipses, proposed by N. Gale (1980, 1982), provide interesting results. Thus, on the illustrations of Strasbourg, we can easily oppose the ellipses of the Gallia student's restaurant to the Place d'Austerlitz (Daniilidis, 1988), for example, visualizing this way, the unequal weight of familiarity with these places (Fig. 10). 51Besides, it is possible to integrate the results as new data — since all the results related to locations are partly quantitative — and to get typologies integrating external or spatial characteristics. The study on Strasbourg has thus allowed the distinction of groups of interviewed individuals, principally differentiated by their length of residence, as we have showed in a recent publication (Cauvin, 1998). 52It is now possible to propose a protocol of research, as in the identification stage, based either on sketch maps or on distance estimations (Fig. 11). 53At this stage, we have information on the identification of the places; we know their spatial position. A place is recognized as significant for us; it has its name, general or specific. This place is located, but we ignore its function, its content, its environment. Thus, we must integrate spatial and non spatial information to describe this place and its attributes. 54A place, after it has been identified and located, cannot really be known without using an external description i.e. its appearance, and an internal description i.e. its purpose (structure and function). It is not a description in order to locate a place, but in order to know what one can do with and within this place. 55A description aims to provide all the internal and external attributes of a place. A place X has characteristics that are changing in time and make evolve its representations. The image of the urban space becomes complete. Moreover, through these three sets of characteristics and spatial knowledge models, we achieve a progressive apprehension of space, already mentioned, described by J. Pailhous in 1970 and concerning taxi drivers. 56Considering all the possibilities concerning description, and the impossibility to obtain absolutely complete characteristics, two terms are proposed to analyze the interest and the quality of descriptions: variety (or diversity, or even span) and completeness (or depth). The first term is referring to all the aspects that we wish to study by describing a place according to the hypotheses; the second term is referring to the degree of detail, according to which we describe one or more aspects. We can look at these two terms together, and interpret the graph thus obtained, in a way similar to the quadrant method (Fig. 12). 59a second one concerning completeness (the depth increases for each attribute which is very thoroughly studied). 60These qualities depend on the data collection techniques. 64search for all qualifiers and terms associated to each word (for a study from the completeness point of view). 65We present here only the results of the global text approach by order of journey (Fig. 13), by underlining that descriptions have always been more abundant during the first journey. This is to be taken into account for the studies to follow. The feeling of repetition, of lassitude, has been very clearly expressed through comments. 67Comes next, an interesting association, because it is common to the three phases of the survey: the feeling of monotony together with the adjective "long" (Figure 14). This explains, perhaps, that in various studies, long distances corresponding to not very attractive avenues have been always overestimated, i.e. lengthened. 68Furthermore, these surveys in three steps have allowed us to highlight the rules of learning concerning the transport by bike; we find again the rules established by J. Pailhous for the taxi driver, but a supplementary variable appears: the route security. The cyclist, contrarily to the car driver, does not appreciate the big avenues, and avoids what is unknown, considered as harmful: "Well, me, I am going to try to avoid, to the maximum, streets without a special lane, because I am not used to, so, I prefer a guarantee of security". 69Other rules have resulted, such as the rule of the habit, but it is also applied to the car driver, even if it is not quoted explicitly. 70Actually, at this stage, the texts allow a great number of readings, depending on the hypotheses; they lead to the formulation of new hypotheses to be examined, which will be the subject of a very thorough experimentation. But it is quite difficult to propose a precise protocol to study the descriptions, since the experience is not yet achieved. 71Four elements are going to be drawn or reminded in conclusion. First of all, these different approaches should be considered as complementary and not as exclusive to each other. They are based on theories, on models of spatial knowledge, and allow the evaluation of various theoretical positions, which are currently developed concerning the decoding of spatial data. 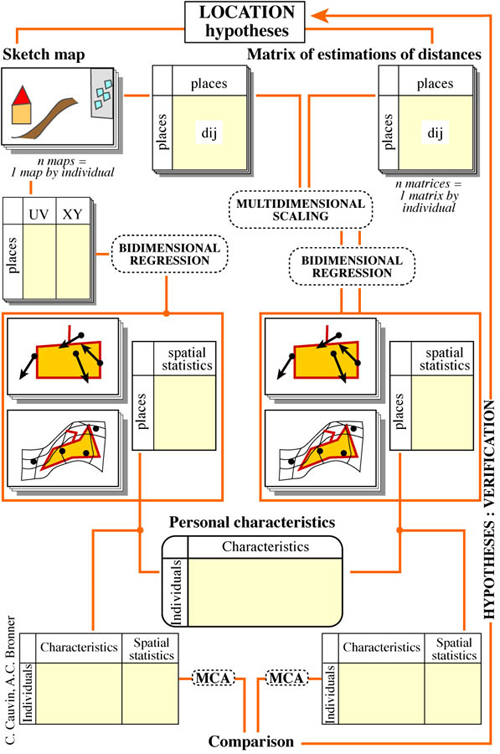 Thus, we obtain a figure indicating the relationships between geographic facts and the acquisition of spatial knowledge (Fig. 15). 72Secondly, we should remind the importance of the quality of comparability, of the capacity to replicate, for the development of any protocol. 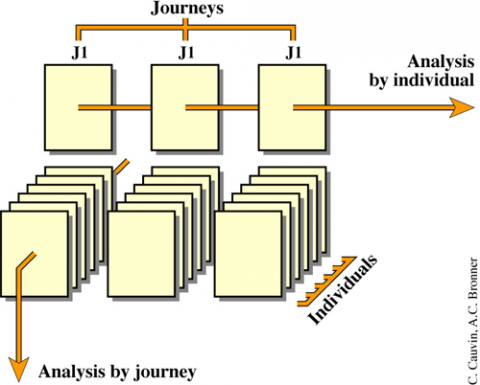 The validity of a step is strongly related to its capacity to provide comparable results. 73Thirdly, it is clear that these approaches allow the apprehension of the urban spatial knowledge for groups of individuals: because we do not work on individuals, but on groups, the explanatory factors have to take into account the cultural as well as the social context. 74Finally, these approaches bring about new hypotheses, which should be verified through experimentation, in the real sense of the term, but in geographical scales. This orientation has already been initiated with a study on urban landmarks, in collaboration with the neuroscience laboratory of Marseille. Bailly A. S., 1977, La perception de l’espace urbain. Les concepts, les méthodes d’étude, leur utilisation dans la recherche géographique. Thèse d’état, Paris Sorbonne, 710 p.
Bailly A. S. et al., 1995, Représenter la ville, Economica, Poche géographie, Paris,112 p.
Beguin H., Thisse J., 1979, An axiomatic Approach to Geographical Space, Geographical Analysis, Vol. 11, n° 4, pp. 325-341. Berry B.J.L., 1964, Approaches to regional analysis: a synthesis. Annals of the Association of American Geographers, Vol. 54, pp. 2-12. Blades M., 1987, How do people use maps to navigate through the world ? Cartographica, Vol. 24, n° 3, pp. 64-75. Blades M., 1990, The reliability of data collected from sketch maps. Journal of Environmental Psychology, n° 10, pp. 327-339. Briggs R., 1972, Cognitive distance in urban space. Ph.D. Ohio State University, 179 p.
Briggs R., 1973, On the relationship between cognitive and objective distance. Environmental design research, n° 1, pp. 186-199. Brunet R., Ferras R., Théry H., 1992, Les mots de la géographie. Reclus, la Documentation Française, Paris, 470 p.
Canter D., 1977, The psychology of place. The Architectural Press Ltd. ed., London, 198 p.
Cauvin C., 1984 a, Espaces cognitifs et transformations cartographiques. 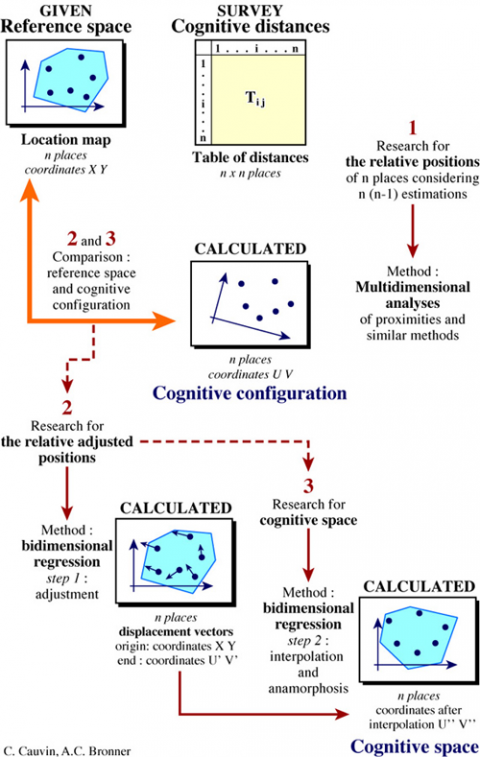 Les conditions de la comparaison des espaces cognitifs: de la carte aux configurations. Exemple de l’espace urbain strasbourgeois. Thèse de doctorat d’État, Strasbourg, fascicule 1, 303 p. ronéotées. Cauvin C., 1984 b, Une méthode générale de comparaison cartographique: la régression bidimensionnelle. Travaux et Recherches, ERA 214 (CNRS), fascicule 4, 130 p.
Cauvin C., 1984 c, Etude des configurations cognitives intra-urbaines. Aspects méthodologiques. Thèse de doctorat d’Etat, vol. I, Strasbourg, 303 p.
Cauvin C., 1984 d, La perception des distances en milieu intra-urbain: une première approche. Editions du CDSH (CNRS). Synthèse et documentation, Paris, 284 p.
Cauvin C., avec la collaboration de Chernai Z., Daniilidis K. 1998, Usagers et représentations cognitives de la ville: exemples à Strasbourg. pp. 301-346. In L’espace géographique des villes. Pour une synergie multistrates. Reymond H., Cauvin C., Kleinschmager R. (coord. ), Economica-Anthropos Coll. Villes, Paris, 557 p.
Cauvin C., 1999, Propositions pour une approche de la cognition spatiale urbaine, Cybergeo, Revue en ligne de géographie, www.cybergeo.presse.fr ,19 p.
Cauvin C., Reymond H., 1984, Connaissance de Strasbourg: déplacements urbains et cognition spatiale. Recherches Géographiques à Strasbourg, n° spécial 25/26, pp. 109-128. Collignon B., 1996, The Inuit: what they know about territories. L’Harmattan, Paris, 254 p.
Guérin J.P., Gumuchian H., 1985, Les représentations en actes. Actes du colloque de Lescheraines. Université scientifique et médicale de Grenoble, Institut de Géographie Alpine, Grenoble, 352 p.
Daniilidis K., 1988, Une approche des espaces cognitifs piétonniers: un exemple à Strasbourg. Thèse de doctorat, Université Louis Pasteur, Strasbourg, 350 p.
Donati M., Fleur D., 1976, Essai sur la perception d’un espace urbain à Cronenbourg par des enfants d’âge scolaire. Mémoire de Maîtrise de Géographie, Strasbourg, texte ronéoté, 70 p.
Forer P., 1978, A place for plastic space, Progress in Human Geography, Vol. 2, N° 2, pp. 230-267. Franklin N., 1996, Language as a means of constructing and convenying cognitive maps, pp. 275-295. In: Portugali J. 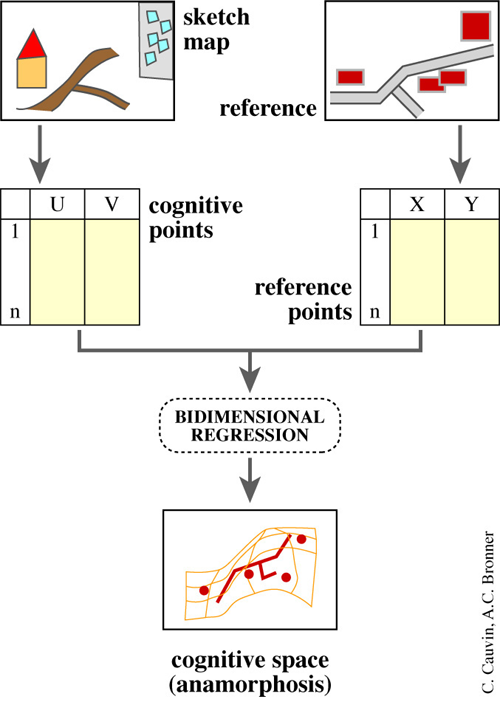 (eds), The construction of cognitive maps. Kluwer Academic Press, Dordrecht, London, 365 p.
Frémont A., 1974, Recherches sur l’espace vécu, L’espace Géographique, vol. 3, n°3, pp. 231-238. Frémont A., 1976, La région, espace vécu, Presses Universitaires de France, Coll. Le Géographe, Paris, 1e édition, 288 p.
Freundschuh S.M., 1991, The effect of the pattern of the environment on spatial knowledge acquisition, pp. 167-183. In: Mark D.M., Frank A.U. (eds), Cognitive and Linguistic Aspects of geographic Space, Kluwer Academic publishers, London, 519 p.
Gale N.D., 1980, An analysis of the distorsion and fuzziness of cognitive maps by location. Master Thesis, University of California, Santa Barbara, 136 p.
Gale N.D., 1982, Some applications of computer cartography to the study of cognitive configurations. University of California. Dept. of Geography, Santa Barbara, 23 p.
Gärling T., Golledge R.G., 1993, Behaviour and environment. Psychological and geographical approaches. Advances in Psychology 96, North Holland, 483 p.
Giraudo M.D., 1989, Espace urbain: image mentale et déformation fonctionnelle. Thèse d’Etat, Aix-Marseille I, 140 p.
Golledge R.G., 1976, Methods and methodological issues in environmental cognition research. In: Environmental knowing. Moore G.T., Golledge R.G., Dowden, Hutchinson & Ross Inc., 435 p., pp. 300-314. Golledge R.G., 1992, Place Recognition and Wayfinding, Geoforum, Vol. 23, n° 2, pp. 199-214. Golledge R.G., Timmermans H., 1990, Applications of behavioural research on spatial problems I: cognition. Progress in Human Geography, Vol. 14, n° 1, pp. 57-100. Golledge R., Dougherty V., Bell S., 1995, Acquiring Spatial Knowledge: Survey Versus Route-Based Knowledge in Unfamiliar Environments, Annals of the Association of American Geographers, Vol. 85, n° 1, pp. 134-158. Heidegger M., 1969, Identity and difference, Harper and Row, New York. Kosslyn S.M., 1980, Les images mentales. La Recherche, n° 108, pp. 156-164. Krupa S., 1999, Représentation et déplacement. Une approche de l’étude des représentations spatiales et de leur influence sur les déplacements urbains. Mémoire de Maîtrise de Géographie, Strasbourg, texte ronéoté, 99 p. + annexes. Kulhavy R.W., Stock W.A., 1996, Annals of the Association of American Geographer, Vol. 86, n° 1, pp. 123-145. Lloyd R., 1994, Learning spatial prototypes, Annals of the Association of American Geographers, Vol. 84, n° 3, pp. 418-440. Lloyd R., Heivly C., 1987, Systematic Distortions in Urban Cognitive Maps, Annals of the Association of American Geographers,Vol. 77, n° 2, pp. 191-207. Lynch K., 1960-1976, L’image de la cité. Dunod, Coll. Aspects de l’Urbanisme, 222 p.
MacEachren A.M., 1992, Application of Environmental Learning Theory to Spatial Knowledge Acquisition from maps, Annals of the Association of American Geographers, Vol. 82, n° 2, pp. 254-274. MacNamara T.P., 1986, Mental representations of spatial relations. Cognitive Psychology, vol. 18, pp. 87-131. MacNamara T.P., 1992, Spatial representation, Geoforum, Vol. 23, n° 2, pp. 139-150. Mattenet M., Jolion J.M., 1992, Analyse de formes déformées, Mappemonde, n° 3, pp. 5-9. Moles A., Rohmer E., 1972, Psychologie de l’espace, Casterman, Paris, 1e édition, 163 p.
Moore G.T., Golledge R.G., 1976, Environmental knowing. Dowden, Hutchinson & Ross Inc., 435 p.
Müller J.C., 1982, Non-euclidean geographic spaces: mapping functional distances. Geographical Analysis, vol. 14, n° 3, pp. 189-203. Pailhous J., 1970, La représentation de l’espace urbain. L’exemple du chauffeur de taxi. P.U.F., Coll. du Travail humain, 102 p.
Pauli W., Jung C.G., 1992-2000, Correspondance 1932-1958, Bibliothèque Albin Michel Sciences, Sciences d’aujourd’hui, Paris, 376 p.
Pocock D.C.D., 1978, The cognition of intra urban distances: a summary. Scottish Geographical Magazine, pp. 31-35. Pyslyshin Z., 1981, The imagery debate: analogue media versus tacit knowledge. Psychological Review, vol. 88, n° 1, pp. 16-45. Relph E., 1976, Place and placelessness, Pion Ltd, London, 156 p.
Riehl P., 1998, Représentations cognitives d’une ville. L’exemple d’une communauté originaire d’Afrique noire à Strasbourg. Mémoire de maîtrise de Géographie, Strasbourg, texte ronéoté, 63 p. + annexes. Rimbert S., 1973, Les paysages urbains, A. Colin, Coll. U, Paris, 240 p.
Rolland-May C., 1981, Note sur l’étude des espaces subjectifs. Caractères géographiques et structure formelle. Mosella, Tome XI, n°1-2, pp.125. Sanguin A., 1981, La géographie humaniste ou l’approche phénoménologique des lieux, des paysages et des espaces, Annales de Géographie, n° 1946, pp. 560-587. Sassi D., 1989, La perception de l’espace chez l’enfant. Etude des représentations cognitives de la ville de Turckheim (Haut-Rhin). 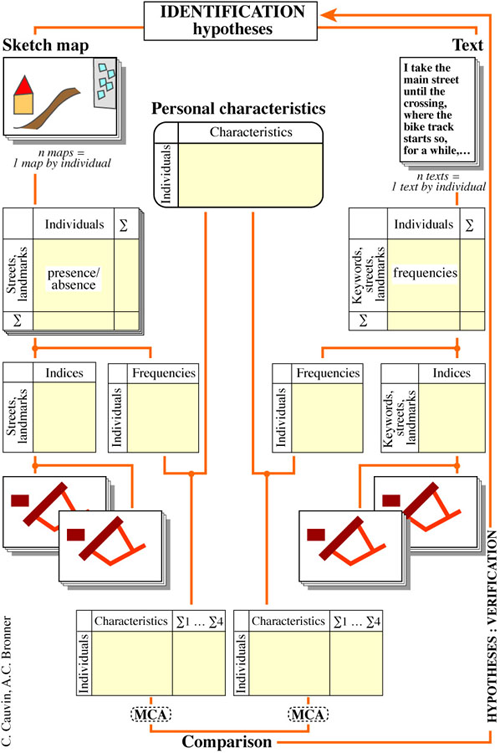 Mémoire de maîtrise de Géographie, Strasbourg, texte ronéoté, 121 p.
Smith T. et al., 1982, Computational Process Modeling of Spatial Cognition and Behavior, Geographical Analysis, vol. 14, n° 4, p.
Spencer R C., Blades M., 1986, Pattern and process: a review essay on the relationship between behavioural geography and environmental psychology. Progress in Human Geography, vol. 10, n° 2, pp. 230-248. Tobler W., 1977a, The trilateration problem. University of Santa Barbara (Ca), 8 p. ronéotées. Tobler W., 1977b, Bidimensional regression: a computer program. University of Santa Barbara (Ca), 71 p.
Tobler W., 1978, Comparisons of plane forms. The geographical Analysis, vol. X, n° 2, pp. 154-162. Tversky B., 1992 Distortions in Cognitive Maps, Geoforum, Vol. 23, n° 2, pp. 131-138. Uexküll (von) J., 1956, Mondes animaux et monde humain. Gauthier, Paris. 166 p.
Varela F., 1989, Connaître les sciences cognitives. Tendances et perspectives. Seuil, Paris, 126 p.